Publisher’s series aimed at the school market are a distinct sub-variety of book series: they were typically bought by teachers or schools through the mail or distributors rather than sold off the shelf in a bookstore. Books not meant to be sold via displays in stores did not necessarily need dust jackets to protect the book or advertise it, and some of these school series don’t seem to have been issued with jackets. These books were often quite cheap (and not including a jacket may have saved a penny or two) and had significantly more printing on the bindings (lists of titles in the series, etc.) that would normally have been included on a jacket. 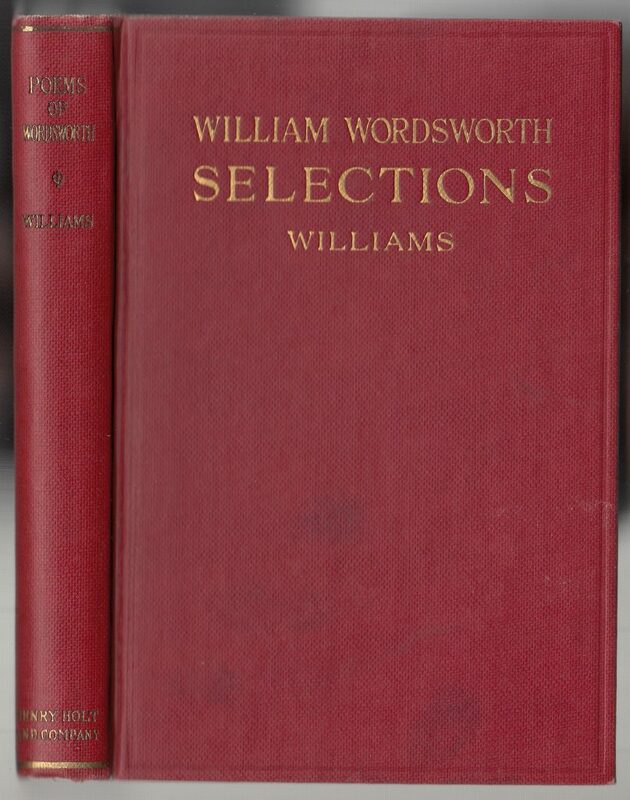 That said, the fact that few of these school series are seen in a jacket does not necessarily mean they did not come with one: case in point, Holt’s English Readings series, and the copy of the Poems of Wordsworth below. 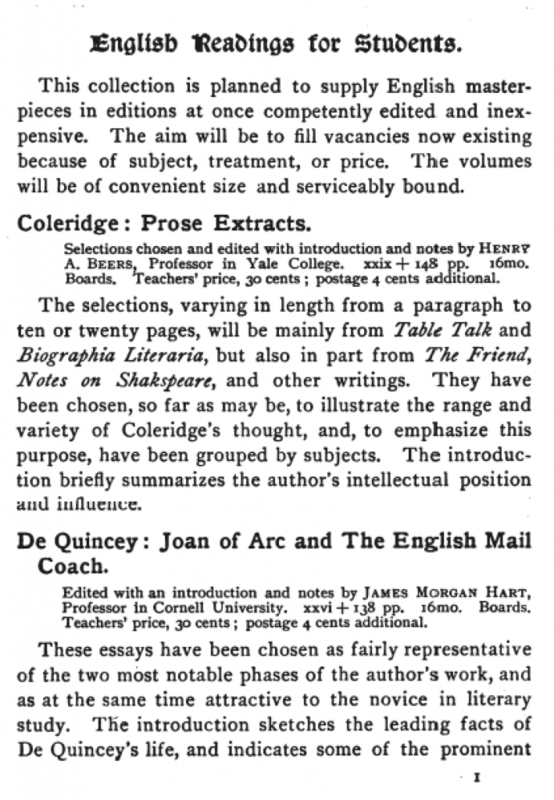 Holt’s English Readings series (or English Reading Series, or English Readings for Students Series) was first issued in 1893 with 4 titles, as included in this early 1894 issue of The Publishers’ Weekly. Titles are priced at .30 to .50 cents. The advertisement also includes two foreign language series, French Readings and German Readings. The English Readings series was one of numerous classics reprint and textbook series issued for high school use. 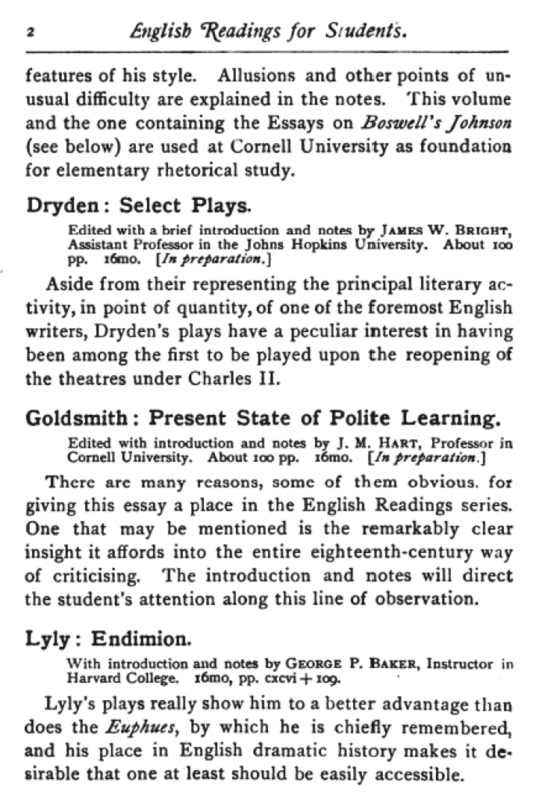 The series was advertised heavily and shows up in many guides and lists for teachers in the late 1800s thru the mid-1930s when the series fades away. 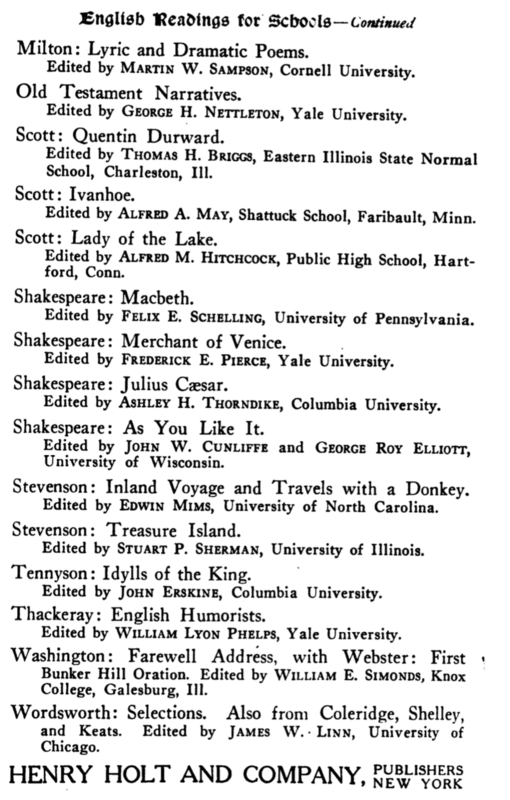 By 1911, the series has expanded to 31 titles (listing from a copy of Shakespeare’s Julius Cæsar published by Holt in 1911). 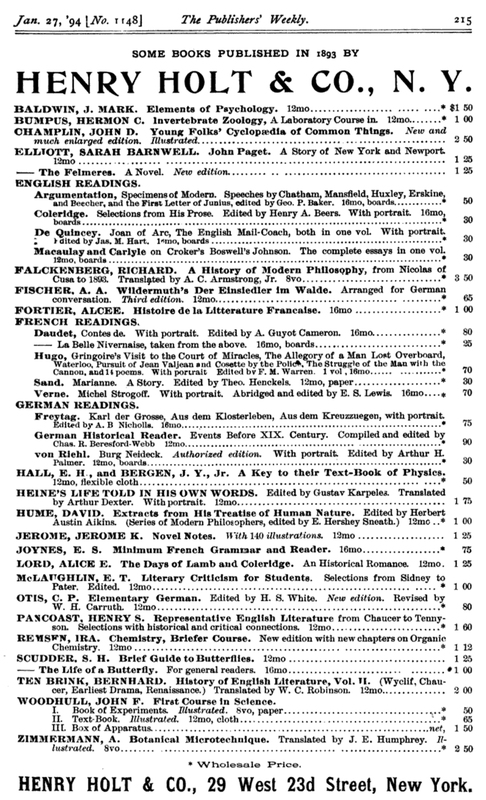 Between 1893 and 1929 the English Readings series published a total of 80 titles, with three announced but not published (ghost titles). 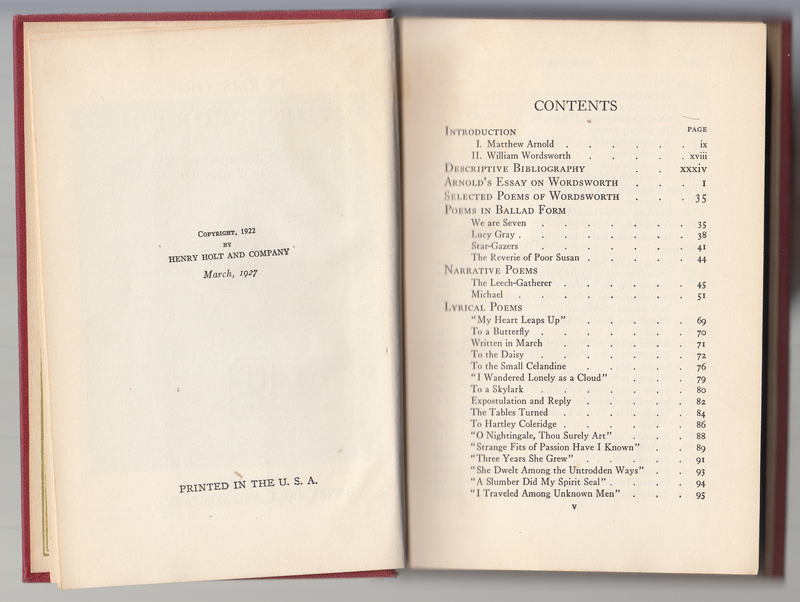 Titles in the series, with their first year of publication, are listed below. The last reprint I can find is dated 1940. ** This title is listed as part of the English Readings series on the jacket (1927) below with no indication of edition. 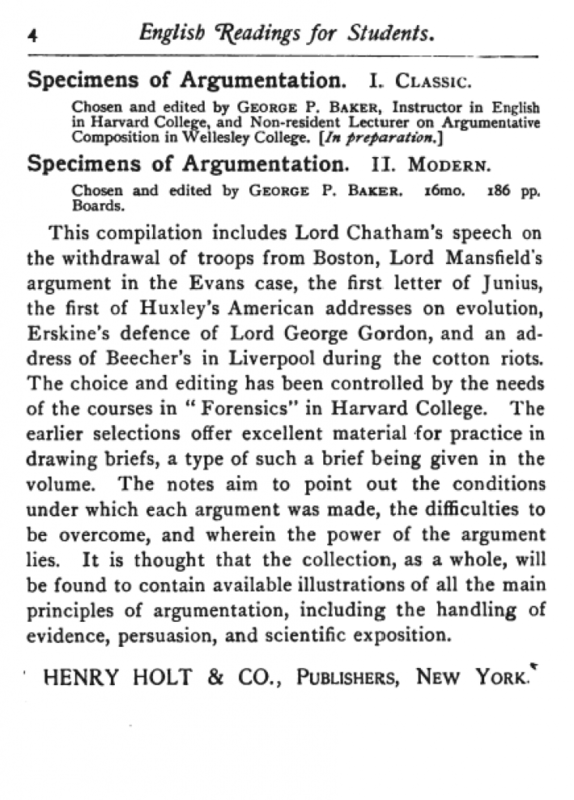 A 2nd edition of this title (first edition was not in the series, and issued in 1894)was issued in 1923, reprinted in 1926 and 1930. 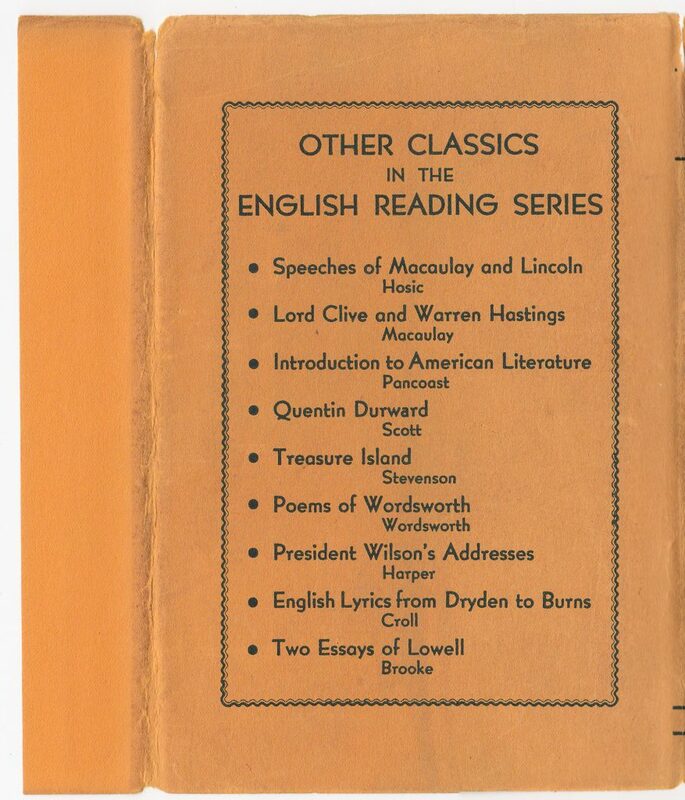 None of the copies on WorldCat indicate it is part of the English Readings series, but it was probably added in 1923 or 1926. I’ve included it under 1926 as that is closer to the date of the jacket (1927) it appears on. 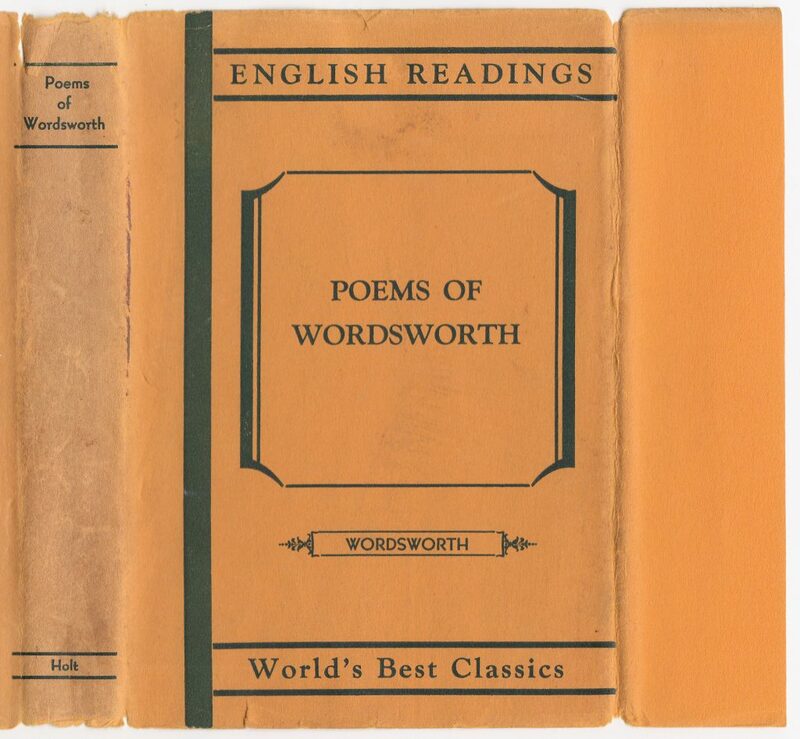 By 1927, when the copy of Poems of Wordsworth shown below was reprinted (initially published in 1922) the English Readings series seems to have been in slow decline (with less than a dozen titles in print). 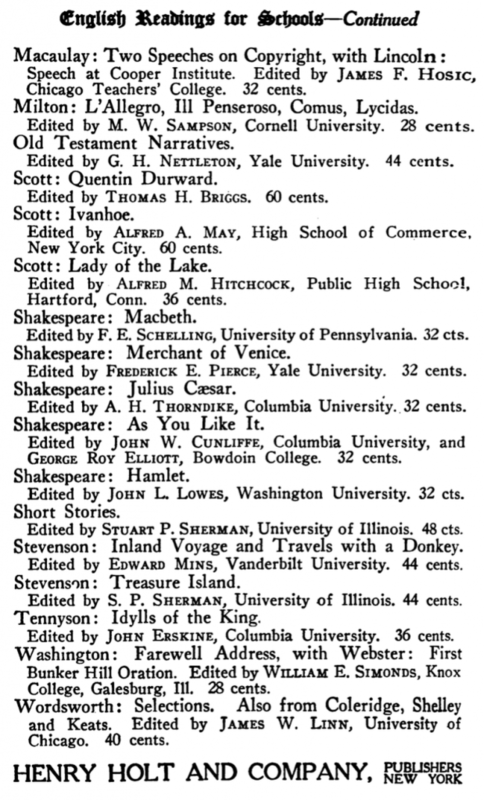 This is a different book than the Wordsworth: Selections title in the 1914 list above (which includes some additional authors and has a different editor). The dust jackets for the series, at this time, were common to the series, printed on orange paper with a minimalist design. The title and author are framed, generically with a bar down the left of the jacket front. The front jacket flap is blank, and very short. The jacket front includes the series name, along with “World’s Best Classics.” This may have been an allusion to the Modern Library’s “The Best of the World’s Best Books” slogan. 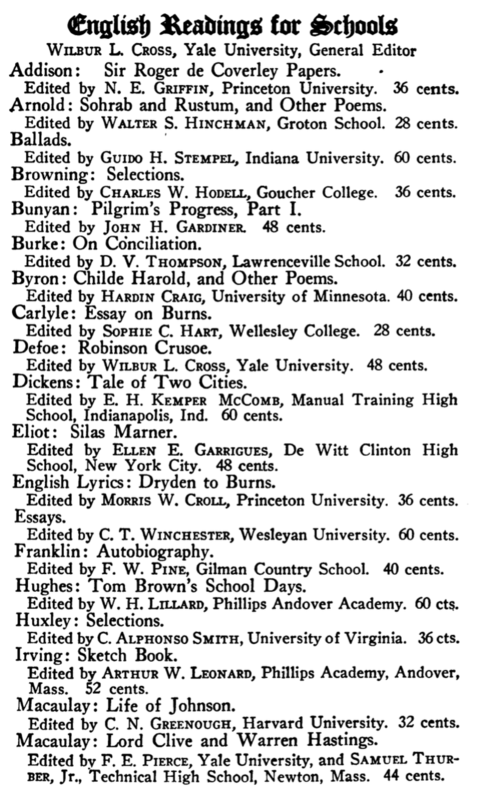 This, in turn, suggests that Holt may have been trying to sell these books in bookstores (where the very popular Modern Library books were sold), rather than only to teachers. The jacket suggests this may have been the case: a book aimed at shelf sales. The rear of the jacket lists nine titles, framed in a wiggly border. The rear flap, short like the front jacket flap, is blank. The books are sturdily bound in red cloth with gold typography and a debossed frame around the front cover. 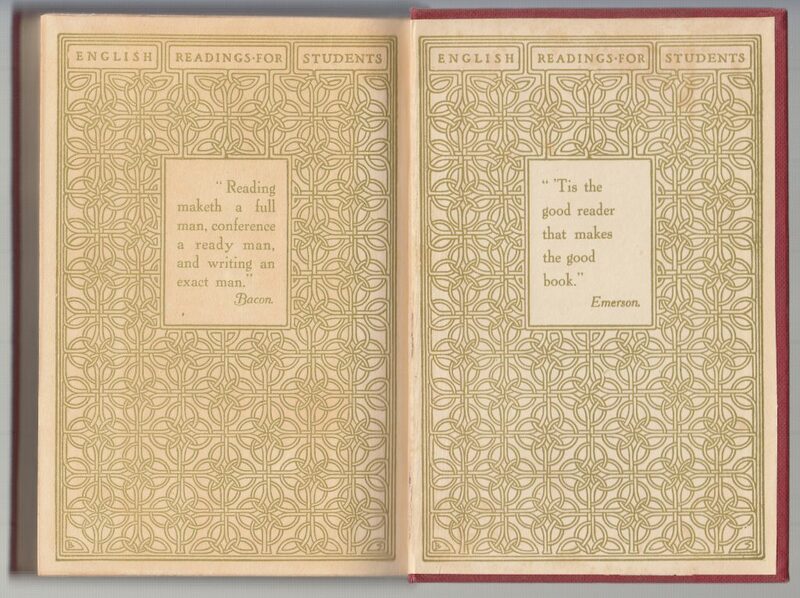 This binding style appears in the early 1910s, after at least two previous binding designs. The endpapers are patterned, with the series name and quotes from famous English language authors. 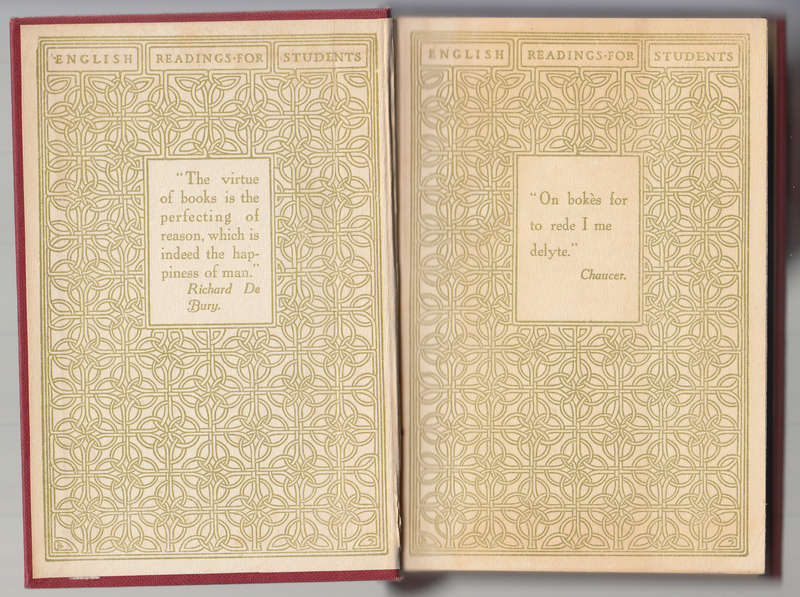 Two quotes are included on the front endpapers and two on the rear endpapers. These quotes are the same, from book to book, in the few copies of this series I have seen. 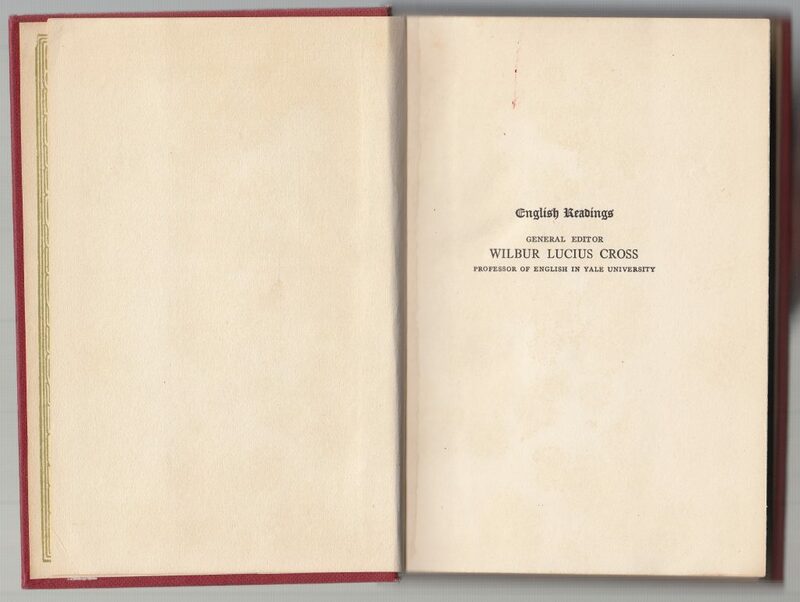 The half title page does not include the book title, but instead the series name and its general editor, Wilbur Lucius Cross (of Yale University). These books were carefully edited, some had notes, and all had scholarly introductions: all apparatus that was expected to be part of books sold for academic use. 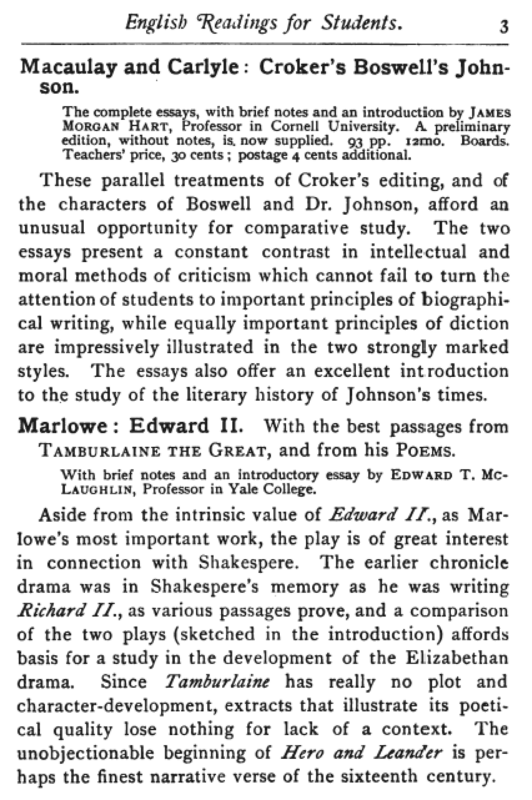 Indeed, reviews of books in this series (and other similar series) were primarily focused on the introductions and notes, and their value to the instructor. 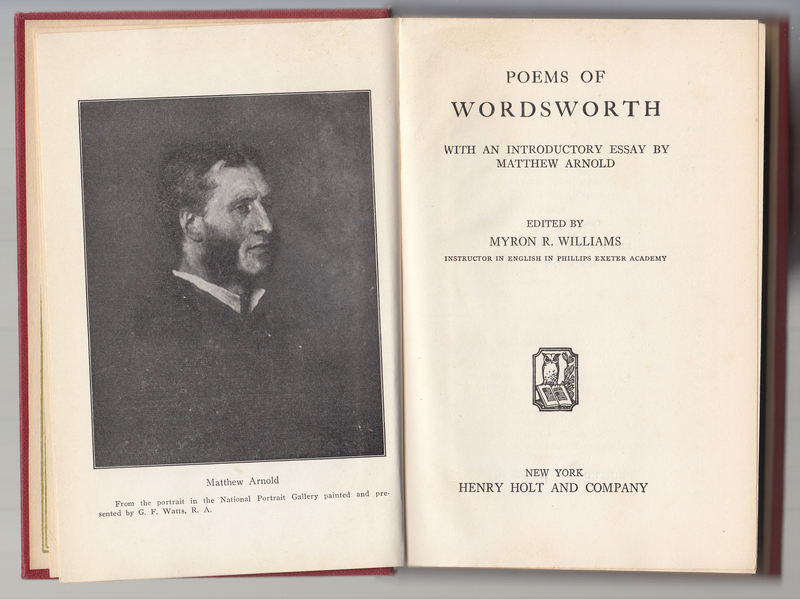 A portrait of Matthew Arnold, who supplied the introductory essay for this volume, faces the title page. It’s a bit peculiar to include a portrait that isn’t the author of the book. 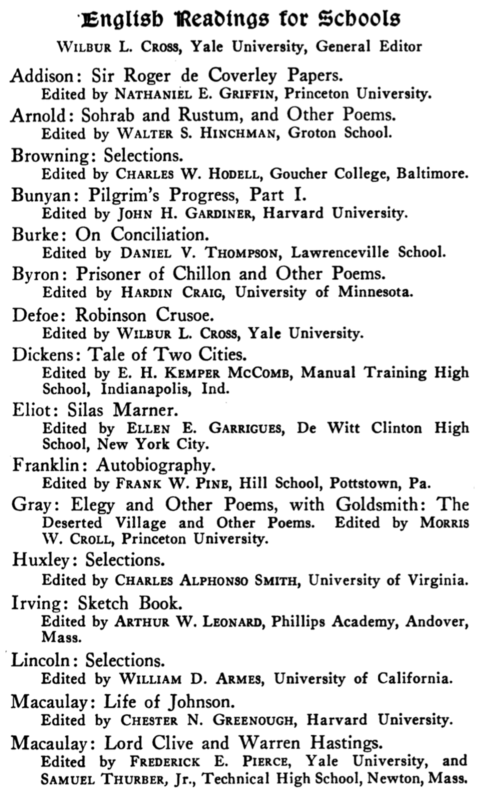 The book’s editor, Myron R. Williams, is noted and the Holt colophon included on the title page. The copyright to this book is 1922, with this printing in March 1917. The rear endpapers continue with two additional quotes, from Bacon and Emerson.